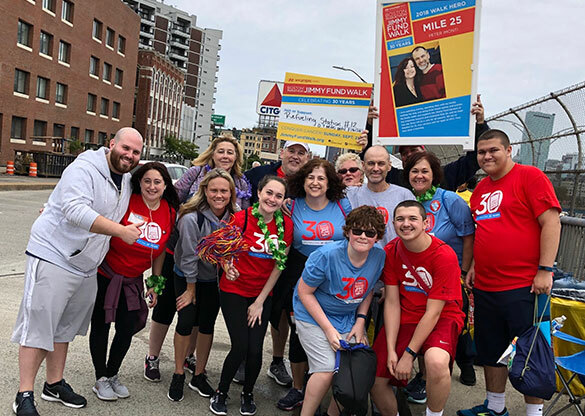 Each year, adult and pediatric patients from Dana-Farber Cancer Institute volunteer to be a part of the Patient Partner program, which is considered the heart of the Boston Marathon® Jimmy Fund Walk presented by Hyundai. We call these Patient Partners our Heroes because they inspire the Jimmy Fund Walk community to raise critical funds for cancer research and patient care at Dana-Farber. On Walk day, Hero photos serve as inspirational markers along the entire 26.2-mile Boston Marathon® course and are on display at the Copley Square Finish Line. Each Hero receives a special Jimmy Fund Walk Hero T-shirt. Both adult and pediatric Heroes can be paired with teams participating in the Jimmy Fund Walk, who walk and fundraise in their Hero’s honor. As a Hero, this annual event is a fun opportunity for you to meet your match Team Captains and share your story. Heroes can register to walk with their match teams or start their own, stand at their mile marker, or join in the festivities on Walk Day in Copley Square. Inspire your team and request to be matched with a Hero. Once matched, your team will walk and fundraise in your Hero’s honor. All Jimmy Fund Walk Hero Match Teams must register and submit an interest form before being matched with a Hero. The Team Captain or Co-Captain should complete this form. All forms will be reviewed and match teams will be notified in Spring 2019. Peter is a Walk Hero and an inspiration for his match team – Team Hope. Contact Stephanie Dolliver, Patient Partner Coordinator, at 617-582-8681 or StephanieM_Dolliver@dfci.harvard.edu.